Arriving in Pisac on Friday afternoon, it felt that I had completed a major cycle in my journey. I am back at my most northerly point, the place from where I reversed the direction of travel and returned to Santiago in August last year. From here onwards, I shall once again be venturing into new territory. A week ago we left Arequipa and climbed 2000 metres on to the Altiplano. It is a short ride, but the change in both landscape and climate is pronounced. Arriving on to the Altiplano, which in parts rises to 4500 metres, we had entered what a local policeman referred to as “the rain zone.” At this time of year the air is unstable; heavy showers and thunder storms pepper the Altiplano, especially in the afternoons. We were lucky – the skies were dark and menacing all around us, but we avoided the rain as we drove eastwards to Puno. A short cut along a dirt track gave Pau the chance to practice riding on rough ground. She also got the chance to practice a river crossing. In fact, she got the chance to practice three, after giving her bike an impromtu wash on the first attempt. She doesn’t take failure very well, so after I recovered the bike from the middle of the river, she insisted on riding it back to the far bank and crossing again. In Puno we finally met up with two motoqueros from New Zealand, Andi and Ellen, with whom I have been communicating via the internet for a couple of months. Travelling from north to south, they were able to offer us valuable information on the route ahead of us. 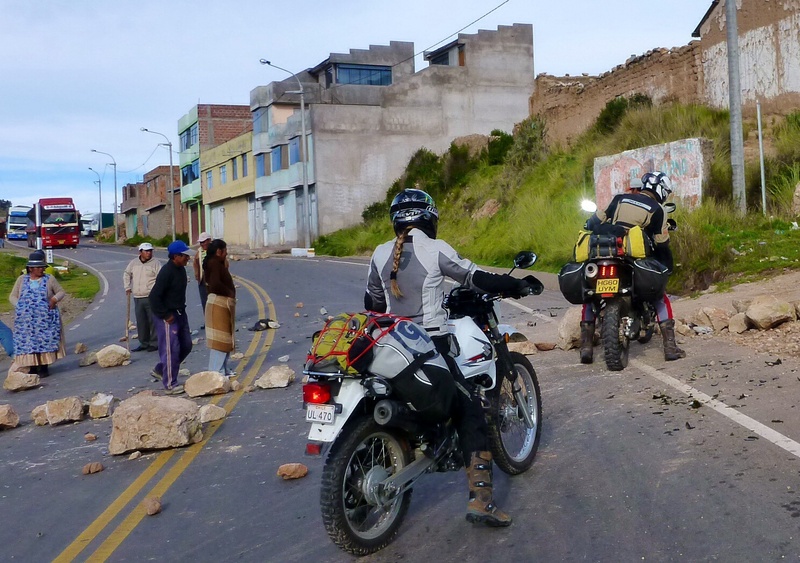 The following day we rode together to Copacabana on the shores of Lake Titicaca. I love the freedom of travelling solo or as a pair, but occasionally it’s good to have company. 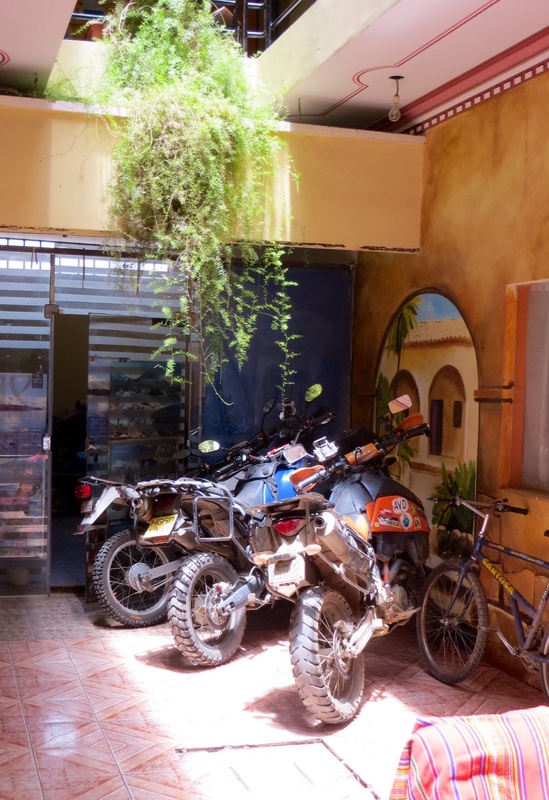 Andi and Ellen have been on the road for about two years, and we shared a common view on moto-travelling. 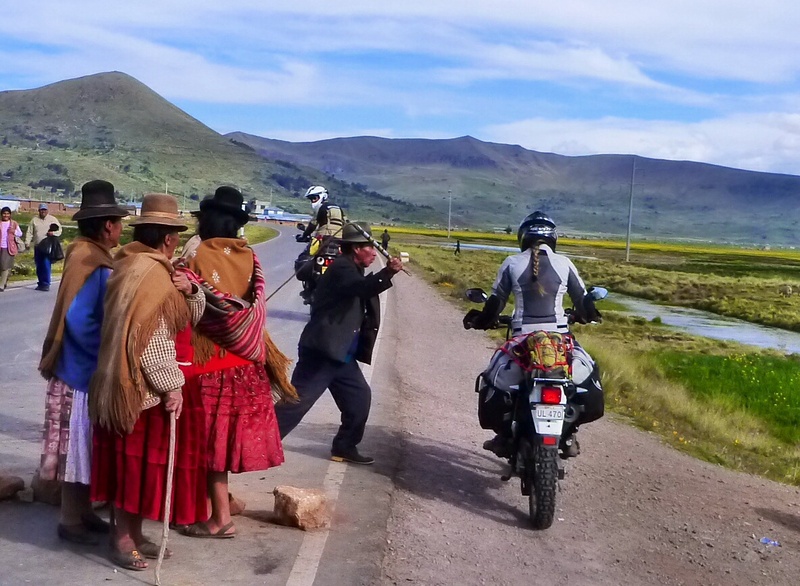 When I visited Copacabana in April last year from the north through Bolivia, my path was barred by road-blocks and protesting farmers. This time, approaching from the west through Peru, it happened again. Spread along a 25km stretch of road, the locals were out in force, blocking the road every couple of kilometres with half-hearted barricades of rocks and the occasional telegraph pole. They were objecting to a recent increase in the price of bus tickets. All-in-all, it was a casual affair. The mood was cheerful and almost festive. On most occasions as we approached a barricade, we were recognised as turistas and waved through. On a few occasions we were stopped, but only to exchange light-hearted banter before being allowed to continue our journey. One old fella, however, obviously hadn’t signed up to this easy-going and hospitable attitude. As we were being waved through at one particular barricade, a man brandishing a whip emerged from behind a group of laughing mamitas. I saw him and assumed, given the cheerful mood, that he was the local village joker, taunting us as part of the fun. But having passed him, I watched in my rear view mirror as he took a swing at Pau. Andi, riding at the back and seeing what was going on, was having none of this; as the Indiana Jones wannabe prepared to take another shot with his whip, he reached out and grabbed the unsuspecting chap by the scruff of the neck and unceremoniously shoved him away. Kiwi hospitality, and well deserved. Compared to their Bolvian counterparts, this blockade was an amateur affair. Last year, the local farmers completely isolated Copacabana for two weeks with a military-style operation, which eventually required police bulldozers to clear. They had blocked the road in about thirty places: in some, they had constructed metre-high barricades of rock and soil; in others, trees had been felled across the road; where the road passed below a cliff, they had used explosives to blow large slabs of rock on to the route. Even the smaller tracks leading to the village had been blocked. The locals standing sentry at some of the barricades had let me through, presumably because they thought I had no chance of reaching Copacabana. I made it only by riding over the banks beside the road, along the storm drains which had been left clear, or simply by creating a small gap in the barricades by hand. After a brief stay in a very busy Copacabana and on Isla del Sol, we bade farewell to Andi and Ellen and headed north under increasingly heavy skies. Finally the rain caught us as we left Sicuani – or should I say the hail. An angry storm broke around us as we hurriedly finished a roadside picnic. It was the first time in 14 months that I rode in ‘proper’ rain. 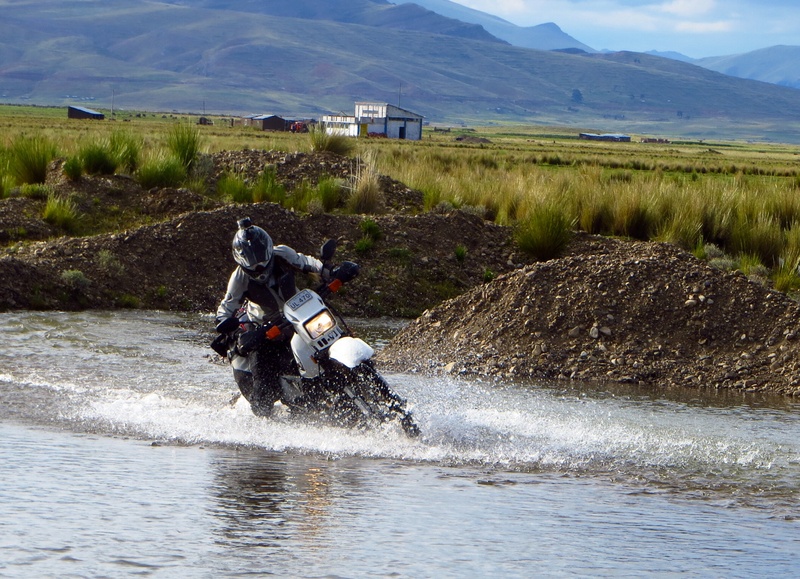 Believe it or not, I haven’t got wet on the moto since I was in northern Patagonia. The wet season in the Peruvian mountains will continue for a few more weeks, so I am anticipating that rain will become an integral part of our travels as we head north – yet another shift if the continually evolving character of this journey. As we catch up with old friends in Pisac, we must now decide whether to settle a while or move on to pastures new. The latter it taking my favour, but Pisac has a habit of trapping people as I discovered last year, so let’s wait and see.